This weekend was not particularly good for productivity. Saturday, we plowed through all of the chores by 3 pm and decided to chill for the rest of the evening. And there was a great rainstorm. Sunday, neither of us wanted to do anything. But after all the rain, our rain barrels were all full (overflowing actually), except for one. It was the one that we have been talking about moving for a while now—it was over by the peach and plum trees. So first, Bruce needed to move a sprinkler. Lots of digging. In the heat. And a trip to the local big box home improvement store for more PVC pipe than we actually needed. Once the sprinkler move was done, we moved the rain barrel. Which also meant changing the gutters. While Bruce worked on that, I was in charge of leveling the ground, putting down stone, and leveling the blocks that the rain barrel sits on. 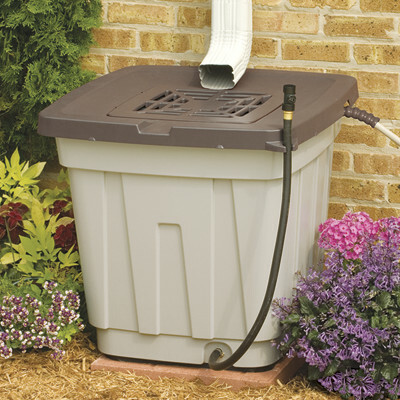 The photo below is a bit misleading—it needs to sit on blocks for gravity help the water flow from the hose when you’re filling watering cans and buckets. Anyway, once we had it in place and the downspout was fixed, we filled it up with extra water we captured from the overflowing rain barrels (we used big buckets and our reno trash can). Well, it promptly sprung a leak! And it had a hairline crack. Ugh. Bruce has repaired it temporarily with silicon and I ordered a replacement this morning. One step forward, one step back. As if that wasn’t a big enough trial in the triple digit heat and soggy humidity, I noticed that Stock Tank #3 wasn’t draining properly. Malfunction! For some reason stock tank 3 was not draining at all and turned itself into a tomato and pepper killing, foul smelling swamp. After digging up and moving the transplants that were drowning, I dug out a quarter of the wet dirt and mixed it with dry dirt from an empty planter then cleared the drain. It seems to be on the way to drying out. Fingers crossed. It did look better this morning. Both Bruce and I were exhausted from all of the digging and the heat. But I have to say after being covered in mud for the better part of the afternoon, it sure felt great to shower. As for the do over, even though it’s Monday, I’m going to treat tonight like it’s Sunday. Water the garden. Putter around. Watch a little tv. Turn my brain off and rest my sore muscles. This entry was posted in Sow and tagged bruce, DIY, Julie Petroski, Mortroski Midcentury Urban Farm, north Texas, rain, rain barrel, sow, stock tank, Texas, weather. Bookmark the permalink. Well, the stock tank situation looks much better. The standing water has drained out and the plants that I saved look ok–peppers are definitely doing better than the tomato (a sweet 100 so Bruce won’t be sad if it croaks). I watered the gardens by hand tonight (without mosquitos!) and there will be tomatoes and okra to harvest in the am. I finally made the pesto I was jonesing to make yesterday. And my puttering means tomorrow’s lunch is already made. Definitely a good do over. Wow! You sure made up for lost time. And thank you for hoping the week goes better. It already has! What hard work! I can relate to the wonderful feeling of a shower after a dirty day. I like to toss on a dress after the evening shower, which seems to be my summer routine. I never thought I’d wear dresses and skirts like I do in the summer. As a little girl, my mom would make me wear a dress or skirt once a week. And I’d try to get through the week without her bringing it up. Now it’s the easiest and coolest way to get ready for work and not boil all day.